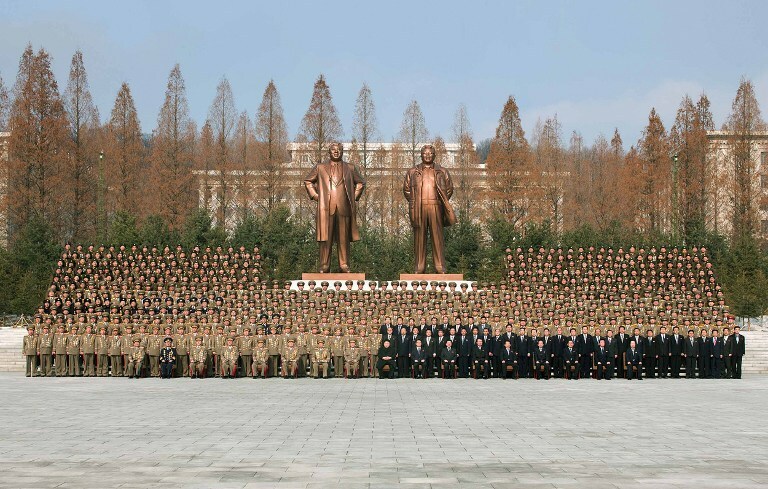 North Korean leader Kim Jong Un (front row/C) is photographed with military officials in front of statues portraying former leaders Kim Il Sung and Kim Jong Il in Pyongyang, in a Feb. 23, 2013 KCNA photo. Former Chairman of the National Defense Commission Kim Jong-Il is regarded as North Korea’s “Dear Leader,” but in fact most North Koreans do not like him very much. North Koreans feel that Kim Il-Sung founded the nation and that it was his son, Kim Jong-Il, who led to North Korea’s downfall. There is certainly some basis for this claim. North Korean life changed drastically for the worse right after Kim Il-Sung’s death in 1994, when a series of large-scale famines devastated the country in the late 1990s. North Koreans, who had received rations and lived comparatively well during the Kim Il-Sung era, then lived in fear of when they might die of starvation. However, if we probe a little further, we may find that the foreign and economic policy failures of the Kim Il-Sung regime contributed to this crisis. Kim Il-Sung not only adopted the former Soviet Union’s problematic policy of state socialism, but also made North Korea’s economic system less efficient. His misguided policies resulted in North Korean economic reliance on the Soviet Union and China. Because of him, North Korea implemented collective farming, completely disregarding the skills of individual farmers. North Korean industry and agriculture then collapsed overnight when aid from the Soviet Union ceased in the early 1990s. Though the economic disaster occurred in Kim Jong-Il’s time, it was a direct result of Kim Il-Sung’s policies. Chairman Kim Jong-Il could indeed have saved many lives if he had wanted to. For example, if he had disbanded the collective farms and distributed land among the farmers as the Chinese Communist Party had done, there would have been relatively fewer people dying from starvation. However, land reforms were not carried out, because Kim and the North Korean elite had determined that if such a system were put in place, they themselves would be deprived of any future. At the same time, Kim Jong-Il had taken measures to provide some relief to the people after he came to power. For example, there was a huge increase in defectors under Kim Jong-Il, but North Korean authorities did not punish them severely. Instead, they were sent to labor camps or to remote and secluded mountain regions. There were also fewer cases of the families of political prisoners being incarcerated than during his father’s time. Kim Jong-Il cannot escape responsibility for the famine that caused hundreds of thousands of people to starve to death. And he is completely responsible for not enacting economic reforms when he had the chance to turn the country’s economy around. Still, it is no exaggeration to say that most of North Korea’s problems during the Kim Jong-Il era arose from the policies of his father’s regime.